This is Sylvester Stallone’s six installment of the Rocky series. And it is the final chapter. But one that saves itself for one good punch. Sylvester Stallone writes, directs and stars in all the “Rocky” stories. 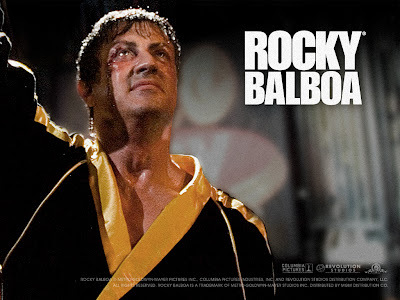 In “Rocky Balboa”, Rocky (Sylvester Stallone) is a retired former champion of the ring. He now owns an Italian restaurant and entertains his patrons with his stories of glory days. Remembered as one of the greatest boxer of all time, his fans love him. Days without boxing can be so hard for a former champ. The current boxing world has a new champion, young, fast, skillful, undefeated but unappreciated. He is a champion that never really proved himself. He was never really tested in the ring. They say he hasn’t got the heart of a real champion. Unloved, hated and booed, he’s a tortured figure who is pained as much as he had anger. His name is Mason “The Line” Dixon (Antonio Tarver). Heavyweight boxing is becoming a bore until a computer simulation cast the two of them together in a virtual match. An old great vs a young champ proves to be highly marketable. Suddenly there came an opportunity for the two boxers to release what they had inside of them. One that says he still has one good fight in him, and the other to tell the world that he is worthy of the title. Sports films are always made out to be inspirational. Rocky Balboa is the inspiration. There is a lot of character in this movie. One can tell by observing the settings of this film. The scenes held deep meanings, if one is sensitive enough. The stories behind each character move the story slowly into a fitting end. Rocky is punching his way into the hearts of others. That punch gained strength towards the final showdown. The body ages but the heart remains strong seems to be the message. Life in itself is constantly throwing those punches at you, getting you down, putting you off track. Without realization you look in the mirror and maybe you cannot even recognize yourself anymore. Fall victim or pick yourself up and clench those fists? After all, fighters fight. Right?